The only vegetable I'm not having any real success with is the lettuce. I guess I'm trying with the wrong kind (although I did try 3 different kinds) and it just starts growing the tall flowery part (or whatever that is called) and no leafs. Lettuce bolts when it is stressed. The most common cause for bolting in the UK is excessive heat, but I think under watering contributes too. Once a lettuce has started bolting it can't be rescued (sadly), but you could allow it to flower and save the seed. It might not even be your fault:it may have had the trigger to start bolting before you tried to re-grow it. Agreement on the last post. Lettuce grows best in cooler weather. It can even be "wintered out" where you can pull back the snow so the frost does not "grow" on it. Keep trying! That is half the fun of gardening. If allowed to bolt, you can still eat it, but it becomes bitter with the flowers. You could also try catching the flower/bolting stalks before they get there to bloom, and pinching them off. That might save enough for an extra meal, or two. Lettuce is an annual. I have never heard of growing it from scraps. I will have to experiment with that next season. Usually I just purchase the small plants. Lettuce grows fast and bolts fast with warm weather. 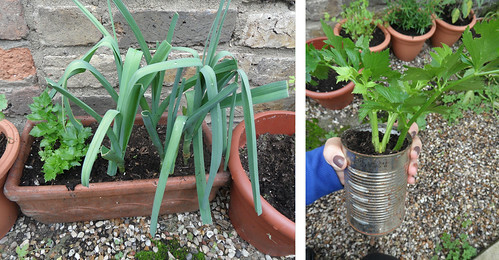 I'm guessing that by growing from scraps you are already starting with an older plant. Also, the smaller pots let the roots get too warm causing it to bolt as well. So let it bolt, seed, and then you can grow from seed, which is the best. We always let some lettuce go to seed (ok, we don't just let it, it just does and we are lazy about pulling it out) and usually get very early spring lettuce in the garden. This year we let kale and cilantro reseed itself and now in October are eating lots of fresh kale and cilantro. The kale should last well into the winter her in Connecticut, longer if we protect with some straw. Fresh veggies in winter are the best. I'll try "proper" gardening next year, although we don't really have a lot of space so I'm still not sure which vegetables I'll plant. I'm also used to growing everything from seeds (my father also grows tomatoes and such vegetables from seeds), but it was a bit late for that this year (we moved in the middle of summer). 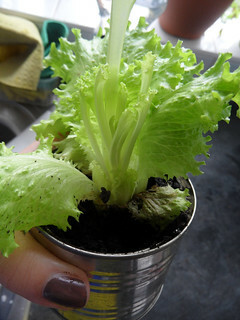 On a similar note, is it possible to grow lettuce from seeds indoors (in bigger potts) during winter?